Without a visit to Halong Bay, Vietnam tourism is much like the Hamlet stage except Denmark's prince. Halong Bay in the Kuang Nin Province of Vietnam is one of the most attractive tourist attractions in the world. In November last month, we were 18 in the beauty page of Halonga under the cloudy sky, with gentle trembling in the winter. The endless blue sky, the blue watery waters beneath, the triangle, the quad-shaped green mountain islands - this is Halong Bay. This place is known as the place of excellence. In 1994, Halsey announced the UNESCO World Heritage Site as the World Heritage Site. In 2012, Halong Bay was ranked as one of the new Natural Wonders. We started enjoying this amazing beauty riding on a boat. Huge number of floating hills in the blue blue chests floating. 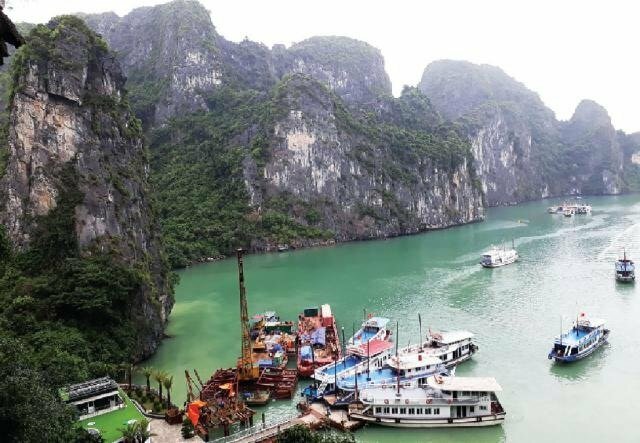 The local legend is very impressive about the origin of Halong Bay. When Vietnam began to emerge as a country, foreigners tried to occupy aggressive power. To protect the country, God sent a few dragon families there. Dragons spray innumerable amounts of jewels. This jewelery gathering is transformed into islands and the islands are organized into an impenetrable wall. Like countless mountains, countless mountains were born on the seashore, and the ships of the enemy were shaken at the mountain walls. After winning the war the dragons decided to enjoy the beauty of the world from this bay. 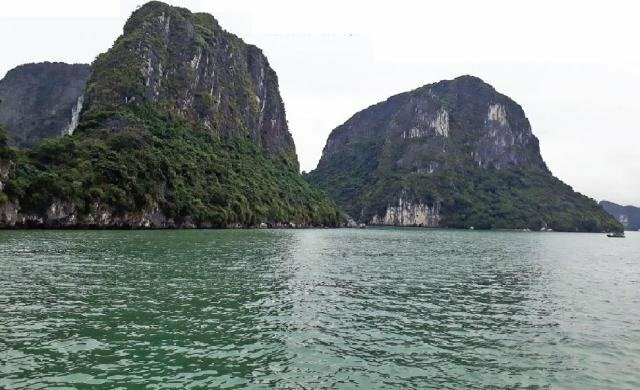 The place where the mother took the dragon seat was named Halong. This is how Halong Bare originates. Halong Bay has been working as a protector of Vietnam several times. Three times the Vietnam army has fought against the Chinese soldiers here. In 1288, the Mongolian ruler Kublai Khan tried to enter his fleet in Vietnam, in Vietnam. The army of Kublai Khan caused the fluttering of the fleet Halong Bet. During the Vietnam War in the last century, the US Navy has set up a mine on several islands. As a consequence, the movement of ships is still threatening along the islands. Mine threat could not disturb us. We have ever seen the beauty of this bay in the boat on the roof. Star rises ahead of our boat to the boat. Already in the ground floor of the boat, we took lunch in the ground floor. Diversified fishes of this bay were an extra attraction for food. This interesting bay is parallel to the history of the world. This unique place originates at least 50 million years ago. Long-time, mountainous geological evolution of the mountains, marine transit, and the Holocaust formed through the marine retreat. We were traveling companions with two government officials in Vietnam. I heard a hollown prehistoric and curiosity in their face and fell into a whisper. 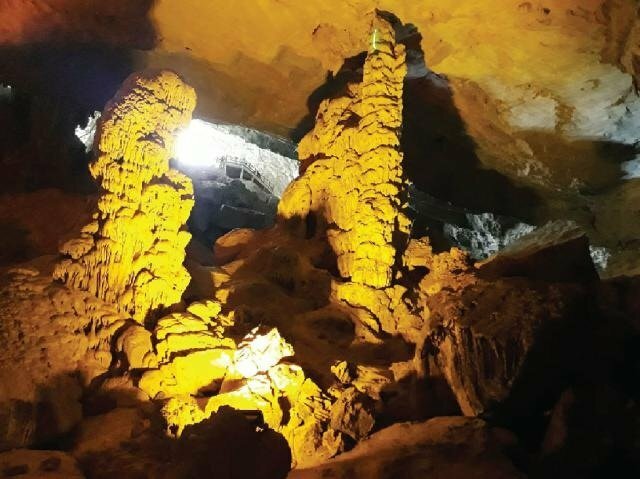 The fascinating sight of tourists from different countries surrounds this cave. Light-eyed Michelle is sometimes shocked by ours. Some are taking high-profile rocks up and taking photos, climbing the group. I used to read the life of primitive people in the school of primary school in childhood. Let us follow the footsteps of the ancestors living in the cave. The difference is only in costume. Primitive people were covered with bark or bark made of trees. And modern-day clothes are worn for people of this era. This wonderful cave is divided into two parts. In the first place, you will feel like a mugged theater. The stem made in the limestone is shining in the light so that the velvet carpets spread. The second part is to enter a narrow road, where one thousand people can climb. A horse and sword made of stone on the right side of the entrance. There is a story surrounding the horse named Thangsiong. He is the historian of Vietnam's history. He freed the local people by defeating the aggressive forces. After the deportation of the enemy, he flew into the sky and left his horse and sword for public protection. This is the end of our Halong Bay journey by paying tribute to the democrat.